Welcome To West Lake Willy Water Park we are proud to be Ontario’s first Giant inflatable Water Park Since 2004 located in beautiful Prince Edward County overlooking The Sandbanks Dunes. Eastern Ontario’s Water Park boasts numerous inflatable water toys situated in a warm lake where lake temperatures reach 26 celsious and above with a sandy bottom and lots of pic nic tables to sit and enjoy the day listening to the carribean vibe music, most importantly a food cart is also located on site for your convenience. The Mountain – Climb, Jump and Slide down this 13 ft tall stacking mountain. We are convientiently located right between Toronto and Montreal! Close to Sandbanks Provincial Park in Beautiful Prince Edward County. Open from 10am till dusk every day from July 1st until mid Sept weather permitting. Westlake Willy Water Park an amazing GIANT inflatable Water Park! All ages can run, jump, climb, swim and spend precious family time on these giant inflatables. 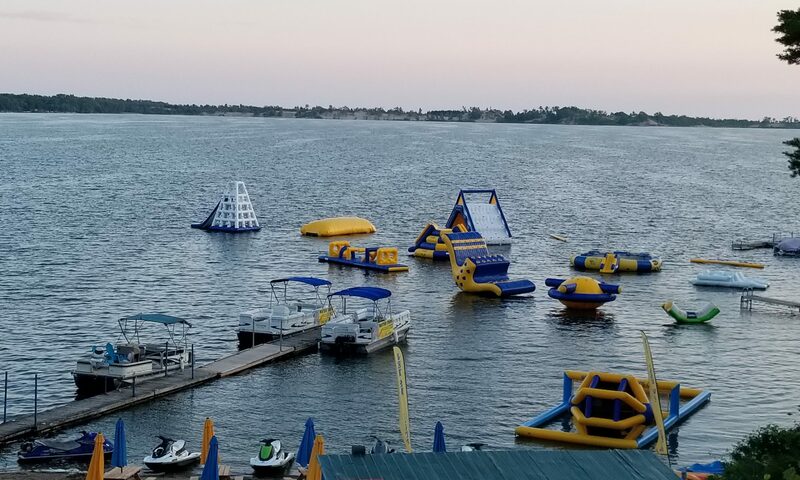 Westlake Willy Water Park has the largest in Ontario ICEBERG 22 ft tall, West Lake Willy has 16ft high slides a 16 ft high climbing tower, A Saturn for spinning and rocking, The Revoloution – A giant water rocker – and The world famous Blob. Just a short drive from Belleville, Napanee, Kingston, Cobourg and Port Hope. This Amazing Water and Beach Playground has numerous pic-nic tables with umbrellas available to use on first come first serve basis, there is a hot dog vendor with snacks also on the beach for your convenience. Westlake Willy Water Park has a change room and portable toilets available, Coolers are also welcome. Kayaks, Standup Paddleboards, Sea Doo and Pontoon Boat Rentals are also available for an extra charge, Please visit Westlake Watersports for pricing. Please be advised – upper body strength is needed to participate fully on the inflatables at WestLake Willy Water Park. Full Time Certified Life Guard on duty. The Water Park is CLOSED see everyone in June!! ***Please Note: Must provide proof of Prince Edward County residency – PHOTO ID REQUIRED UPON ARRIVAL. All tickets sales are final and are non-refundable. Prices subject to change without notice.